Book readings, auctions, live music, conversations, and free gifts are some of the things Book ‘N’ Gauge is known for, and this month’s edition promises all that and more. The monthly book reading event will hold this Saturday at Debonairs Bookstore. This edition doubles as the award giving ceremony for the PEN Nigeria/Saraba Poetry Prize. 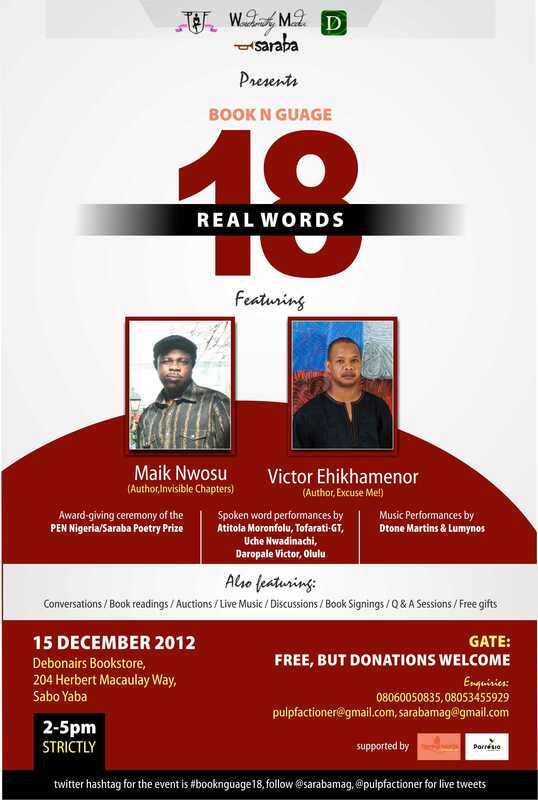 Maik Nwosu, author of Invisible Chapters, and Victor Ehikhamenor, author of Excuse Me!, will read from their books. The event will also feature music performances by D’Tone Martins and Lumynos, and spoken word performances by Atilola Moronfolu, Tofarati-GT, Olulu, Uche Nwadinachi, and Daropale Victor. Venue: Debonairs Bookstore, 204, Herbert Macaulay Way, Sabo, Yaba. Book ‘n’ Gauge is organised by PulpFaction Book Club, and is aimed at creating a platform where reading is seen as cool.